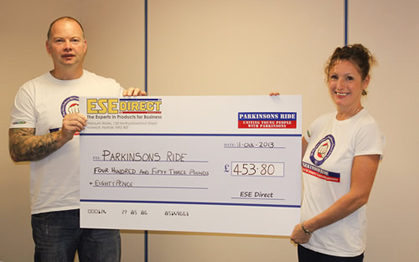 ESE Direct's monthly charity drive continued with a donation for Norwich-based support group; Parkinsons Ride. The winners of September's vote won through against strong competition from Macmillan and Home Start Norwich to claim the donation of £435.80 which was presented to two representatives from the charity in ESE’s head office. Parkinsons Ride is a Norwich-based support group set up 3 years ago by Mark Whitworth himself diagnosed with Parkinson's at the age of 38, to help younger people with Parkinson's. Many people may believe that Parkinson's is a disease of elderly; however one person is diagnosed every hour in the UK, one in twenty of whom is under forty years old. They aim to raise the awareness that Parkinson's is not just an older person’s disease and to help those in and around Norwich with the condition as well as fundraise to help to find a cure. They are a small but proactive team of volunteers who believe that facing life with an incurable, neuro-degenerative disease can be made slightly easier by facing it together . Diagnosis at an early age can be devastating and Parkinsons Ride are there to help those effected and their families to help them live with symptoms which include tremors, problems walking, lack of balance and insomnia. Collecting the cheque from ESE Direct's office were Chairman and founder Mark Whitworth and Press Secretary Niki Oldroyd.